Memorializing a loved one in Chagrin Falls, OH, starts with the right headstone company, and Classic Memorials is the leader in the industry. Our expert artisans are able to capture the spirit of the person you loved so dearly and create a memorial that truly honors the best of that person. A life lived well is worth celebrating. We understand that and work to make sure each precious life received customized recognition. We’ll take the time to listen to your favorite memories to gather a picture of that person, then we will work to make it come to life on a beautiful headstone. Our proven processes have been honed over five decades to include a tight system of control for quality purposes, resulting in a spectacular end product that you’ll be proud to display in honor of your loved one. Our master engraver, Val Konstantinovsky, holds the distinction of being one of a handful of artists designated as a Monument Builders of North America Certified Memorialist®. This means that Val has been honing his artistic skill for his whole life and has reached a master level in creating beautiful headstones and monuments that capture the personality of the person you love. 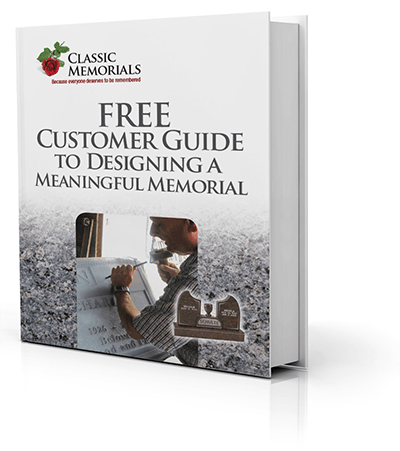 For more information, you can see our list of satisfied customers who will tell you in their own words how Classic Memorials not only met but exceeded their expectations during a difficult time in life. It’s our goal to work hard for each client to make sure their headstone or memorial is an excellent representation of the loved one. We are proud to be an integral part of the Chagrin Falls community. We love giving back to this area that has given us such a full life of food, fun and friends! We can’t imagine living anywhere but in this beautiful area where raw nature meets cultured neighborhoods in a lovely communion. On quiet evenings, you may see us enjoying the birds at Fohring’s Meadow or just grabbing a great book at Fireside Book Shop to take home and enjoy. Whatever the next day brings, it’s sure to be a great part of a life happily lived in Chagrin Falls. Let’s get started discussing your headstone needs at (800) 278-8523 or email us. We’re ready to schedule a consultation to learn more about your needs and to start designing the stunning creation. Our craftsmen and artists will be busy bringing your creation to life by applying their carefully developed skills and God-given talents to the project. In the end, you will have a masterpiece that will memorialize your loved one in a true celebration of a life lived to its fullest.